An arched version of Tammy's Garden Swag. 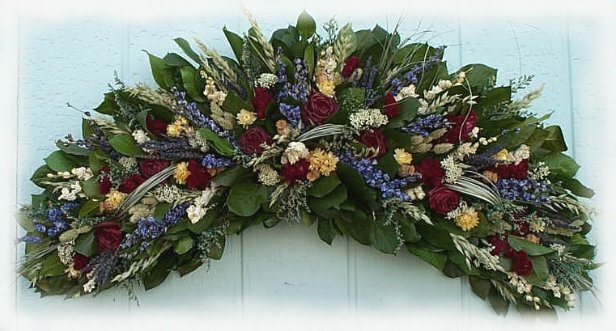 handmade roses, green grasses and grains, larkspur, australian daisies, rice flowers, globe amaranth, celosia, yarrow, lavender, poppy pods, moss, preserved statice and caspia come together on a bed of preserved salal. Swag shown is 36". I'VE MENTIONED YOUR WEBSITE AND INFO ABOUT YOUR COMPANY TO EVERYONE I'VE RUN INTO! I'M VERY IMPRESSED AND WILL BE ORDERING WITH YOU AGAIN IN THE FUTURE!THANKS - KEEP UP THE GOOD WORK!